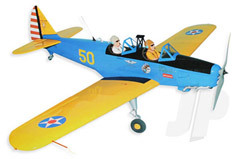 All Products > "5500085 Seagull PT-19 Giant Scale"
Forever, well as long as we can remember, the PT-19 has been a popular choice for classic model pilots because of their looks, flying characteristics and a bit of nostalgia thrown in. This PT-19 boasts a large 202cm wingspan so it�s not a small model by any means and this large scale helps make this PT-19 a formidable model. We get use to seeing a well presented kit from the Seagull factory and this is no exception. Opening the large box you will be faced with a neatly packed kit with all contents individually pack and secured ensuring the kit reaches you in the best possible condition. Seagull where keen to make this PT-19 look as scale as possible so included features like, Oleo sprung undercarriage, split flaps, exhaust pipes, two light weight pilots, cockpit detail and a traditional scale colour scheme cut from Oracover. In our book a 4 stroke is the only way to go with this type of classic aircraft but there is also a 2 stroke option.